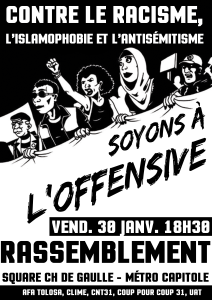 ← Meeting contre l’islamophobie à Saint-Denis, le 6 mars 2015. 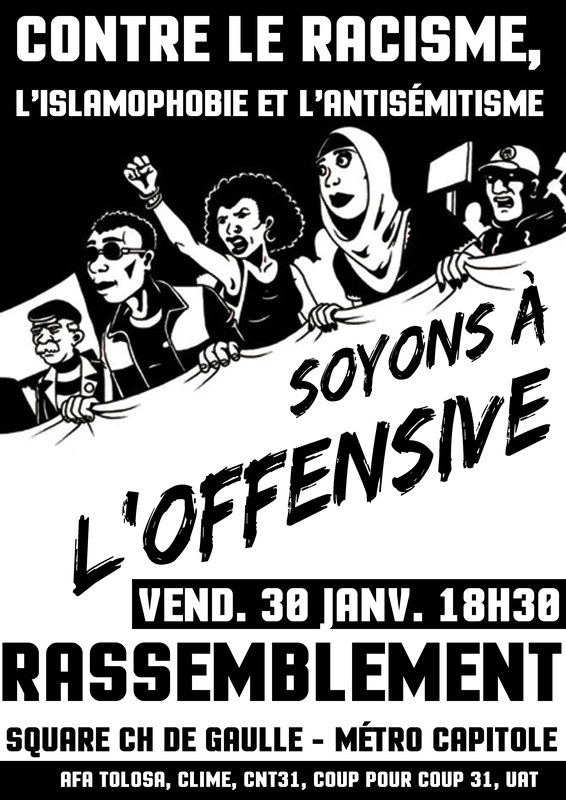 State racism(s) and philosemitism or how to politicize the issue of antiracism in France ? I’d like to start by reminding the audience that French consciousness is strongly structured around the memory of the genocide of the Jews which is commonly referred to as the Shoah and that this consciousness is the backbone of French antiracism. The first one was made by Raymond Barre, on October the third, 1980. A bomb killed three people in front of a synagogue located in Copernic Street in Paris. The Prime Minister (Raymond Barre) claimed it was « a horrible attack which meant to hit Jewish people going to the synagogue and which hit innocent French people who were walking across the Copernic street ». Consequently, for the Prime Minister, Jewish people are not French since they are opposed to « innocent French people » here. The second one comes from Jacques Chirac, President of the Republic, when he declared in his televised speech on the fourth of July in 2004: « We are facing a time when racist incidents (…) endanger the safety of our Jewish and Muslim compatriots or sometimes just French people… ». 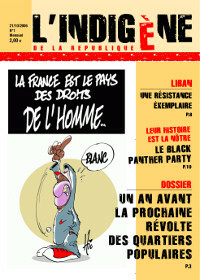 This time again, the Jews as well as the Muslims are discriminated from the French national body. The third slip was expressed by François Hollande last week, a few days after a Jewish cemetery had been desecrated. 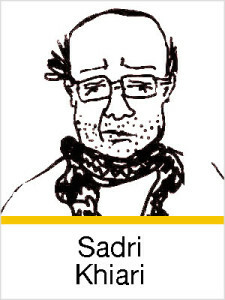 In the speech he delivered during the gala dinner organized by the CRIF (Jewish institutions representative council in France), he claimed : « I was in Sarre-Union last week, in the cemetery which was devastated by young high school students, who are French of old stock (« Français de souche »), as we say. ». When the President of the Republic uses this phrase « French of old stock », he exclusively refers to white Christians (and the ones who committed this crime were indeed white Christians) and excludes the Muslims as well as the Jews from the old stock. What these Freudian slips indicate is French state truths. Whereas the « national narrative » gradually readjusted after the Second World War, and we have been talking of a « Judeo-Christian civilization » over the last two decades, the « Jews » as a category are still not a fully legitimate part of the nation and its identity. France remains the eldest daughter of the Roman Catholic Church. To be part of the legitimate body of the nation state, you have to gather together three criteria: to be of European descent, to be Christian (whether you are a believer or not, a churchgoer of not) and to be white. For instance, if you are Christian but of Lebanese descent, or white but Turkish, you are not white. You have to gather together the three qualities to be fully white and therefore completely French. Please bear my preliminary remarks in mind. I will return to them as I develop my presentation, and now let’s now turn to the topic of our discussion: “Minorities, nationalism and nation-states”. On the seventh of January, dramatic criminal attacks occurred in the French capital. These attacks decimated Charlie Hebdo editorial board and targeted a kosher supermarket and caused the death of 3 young Jews. At the top of the state, the officials first promoted the return to tranquility. The state had to prevent an escalation of the situation. He advocated a policy of « sacred union » at large scale around « the values of the (French) Republic » and more accurately of the western world. Most of the political parties followed this policy, with a few exceptions. It’s the spirit of the historic demonstration which took place on the eleventh of January, 2015, and gathered the official representatives of powerful western nations and even of NATO. Secondly, the state reinforced its security and legislative apparatus against the Muslim community. To perform this mission, they summoned three of the most important state departments: the Ministry of Home Affairs, the Ministry of Justice, and the Ministry of National Education. The three of them pooled together their competencies to strengthen the repressive machinery against allegedly Muslim people who, as a whole, were considered as potentially prone to Jihadism. This happened with the complicity of a large part of the social actors. On the one hand, imbued with the memory of the genocide of the Jews and of the devastation caused by anti-Semitism. And it is antifascist, on the whole, with all the nuances required. On the other hand, it has been historically antiracist and rather anticolonial, still with the nuances required. It is therefore in favor of the struggle against racism against black people, Arabs and Roma, but what characterizes this antiracism is its being abstract and moral. Racism is not understood as a structural phenomenon which creates statutory, although not official, categories – whites and non-whites, whom the state will give economic, politic and symbolic power in an unequal manner. Thus, racism is not defined as a system of privileges, which empties it of any political dimension. For the main part of the « real left », racism is a product of the far right. Which of course exonerates this left from liability, prevents it from thinking that republican racism impregnates it and hinders its own aggiornamento on the matter. The killers are Muslim. They are part of a group that the left must defend. A group which is dominated, exploited, socially and racially crushed and making up a community with a common fate and a common lot. But these killers targeted another community with a common fate: the Jews. More than a community with a common fate, it’s a community thanks to which the left gradually restructured its humanist consciousness. There is the left which refuses to recognize islamophobia as a form of racism. This part of the left has an advantage compared to the other one, which is to solve the dilemma by denying islamophobia. And there is the left, whose importance is increasing, which starts recognizing islamophobia. It’s this branch which interests me here. This left solves the dilemma with a rhetoric device. They make up fake symmetries. They denounce islamophobia AND anti-Semitism at the same time. The simplistic approach they take has only one aim: to avoid the fundamental questions in order to avoid the controversial questions, to avoid the controversial questions in order to save the white left. Let me tell you what I mean. For us, it is important to identify the frame of the production of racism: the imperialist nation state. Structural racism cannot be understood if you don’t understand the nature of the relationship between the North and the South and the global racialization of humanity for the needs of imperialist exploitation before anything else. In other words, you cannot understand islamophobia if you don’t understand the war in Afghanistan and Iraq, as well as you cannot understand negrophobia if you don’t understand France’s post-colonial/neo-colonial approach to Africa (« Françafrique »). Similarly, you cannot understand republican racism, if you don’t understand the necessity to select a body of privileged people – the Whites – and to distribute power and wealth according to racial criteria in particular for the sake of the nation state’s survival. In other words, you have to understand the reality of the « wages of whiteness ». It’s only when you come to understand this mechanism that you become able to develop efficient policies. This left which is finally convinced by the necessary struggle against islamophobia is not fit yet to grasp the underlying logic of state racism but the fact that it has decided to mobilize against the security laws which are aimed at the Muslims is a significant step that must be judged positively. But here is the question I ask as a decolonial activist: why does this left care so much about connecting the struggle against islamophobia to the struggle against antisemitism? As for me, I have no objection in principle provided we apply the same methodology as the one applied to islamophobia, racism against black people or racism against Roma, which means to identify the frame of the production of antisemitism. The problem is this left is careful not to do so. Obviously, the frame of production of antisemitism is not the state. The Jews in France are not discriminated against as far as job and housing opportunities are concerned, they are not harassed by the police and don’t have to endure antisemitic media propaganda at large scale. If it’s not from the state, where does it come from? There are indeed in France political parties, and in particular the National Front (FN), which, even if it tries and hides its deeper nature, remains antisemitic. As well as there are also fascist/ French identity supremacists or neo-nazi groups which are clearly antisemitic and among which are enlisted the youngsters who desecrate Jewish cemeteries. But the question remains: are these the frames of the production of antisemitism? I, for certain, don’t think so. Rather, I believe they build their antisemitic consistency on the very existence of the nation state which is based on Christian identity. So, if neither the State nor the far right are the frames of the production of antisemitism, what is it? Over the last few years, one has been tempted to assert that the poor non-white suburbs (« la banlieue ») generates antisemitism. 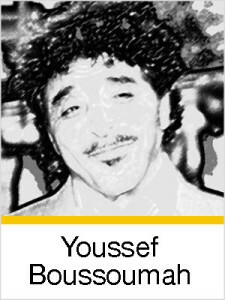 We can quote as examples Mohamed Merah, Mehdi Nemmouche and Amédy Coulibaly. The three of them targeted and killed Jews. We can also mention the alliance between Dieudonné, who is a famous black comedian, and Alain Soral, who is a far right activist, especially antagonistic towards Jewish people. As the left faces this new reality, it is very ill-at-ease. How can it continue its historical fight against the « foul beast » while defending the oppressed if they take part, to a greater or lesser extent, in the « renewal » of antisemitism? The left is all the more ill-at-ease as it is completely unable to identify the specific frame of the production of this « new antisemitism ». Can it accuse the Muslim community as a whole without becoming racist itself? Can it blame the poor suburbs without creating an inaccurate and dangerous link between these suburbs and antisemitism ? Indeed, the poor suburbs don’t form a political unity unlike the far right groups who claim themselves to stand for this political sensibility. That’s the reason why the left takes the simplistic approach when it chooses not to look for the structural causes of both islamophobia AND antisemitism. 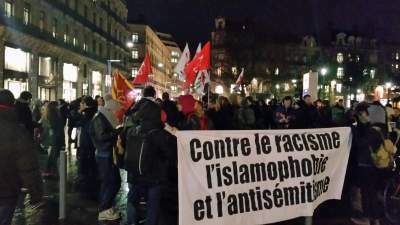 That’s the reason why it chooses to use empty slogans, which are devoid of any political substance, when connecting the struggle against islamophobia and the struggle against antisemitism. I must add that the most radical left only acts this way. As far as the not radical left is concerned, it struggles against racism and antisemitism in an abstract manner, and makes sure that it names the names, so that it makes differences and prioritizes and therefore puts the struggle against antisemitism first, which of course is worse. Soothe the whites’ conscience and turn the Shoah into a new « civil religion » by stripping it off all of its historicity. Commemorating the Shoah equals, in a way, to a full and final settlement of all claims. The state pays its debt to the Jews and buys a new moral probity. But in doing so, it generates a memorial discrimination, since, while using the memory of the genocide of the Jews as a political tool, it conceals the memory of the slave trade – which upsets the Afro-West Indian communities -, it conceals the memory of colonisation – which upsets the Muslim-Arab and the African communities -, it conceals the memory of the genocide of the gipsies – which upsets the Roma community- and brings about resentment against the Jews who are rightly considered as the « sweethearts of the Republic ». Here lies the first source of antagonism by post-colonial subjects towards the Jews. Become the spokesperson of the western world or more accurately – to use a metaphor – its Senegalese Riflemen (« tirailleurs sénégalais »), in particular by means of another colonial nation state : Israel, whose mission is to secure the western world’s interests within the Arab world. The Jews, because most of them have been incorporated by the Zionist movement into the Israelian design, are turned into accomplices in its crimes, as it happened last summer in Gaza. On this subject, I encourage you to read the outstanding book by the Israelian writer Yitzhak Laor entitled The Myths of Liberal Zionism – which includes an essay on Europe’s new philosemitism- in which he says, I quote : « The feet and the fists are the western world’s ones, but we are the boots and the steel punches. 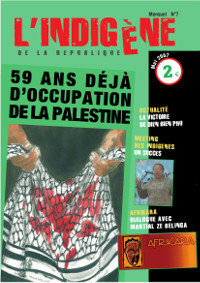 » Those who use the Jews as a political tool for the benefit of Israelian interests are definitely the Zionist movements with the complicity of the French officials who every year go to the CRIF (Jewish institutions representative council in France) gala dinner and who have made Zionist organizations their privileged partners. This behavior adopted by the French government is denounced by other Jewish associations: the UJFP (French Jewish Union for Peace), the French branch of the IJAN (International Jewish Anti-Zionist Network) or « Another Jewish Voice » who rightly see this as a danger for all the Jews in the world. I cannot resist telling you the story of these riflemen coming from Africa who were guilty of committing atrocities in Morocco during the French colonisation. Of course, they were forced to enlist and it was on behalf of the colonisation that they committed these atrocities. The women who were raped and the villages which were devastated kept in their memories that the cruelest ones were the Senegalese. This left indelible marks in the country’s memory. They absorbed part of the Moroccans’ hatred against the white settler. 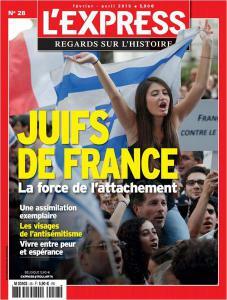 Nowadays, the Jews are the shields, the riflemen of the French imperialist policies and its islamophobic policies. Because they nowadays benefit from a « positive racialization » on the one hand, and because the conflation of Jewish and Zionist is constantly fuelled on the other hand, they divert the anger of the wretched of the earth on them and at the same time protect the racial infrastructure of the nation state. They protect the white social body. Here lies the second source of resentment against the Jews which has nothing to do with European antisemitism as you can see. Therefore, if you are clearly antiracist and you worry about the rise of the far right which is going to target the people living in the poor suburbs in priority and you worry about the fate of the Jews who have become targets of terrorist groups, you have to be brave enough to contest the current forms of state racism : islamophobia, negrophobia and romaphobia and to contest the state philosemitism which is a subtle and sophisticated form of the nation state antisemitism. Last question: what is it that prevents the « real left » from struggling against state philosemitism? I will answer unambiguously: the real left is itself, with a few exceptions, philosemitic. 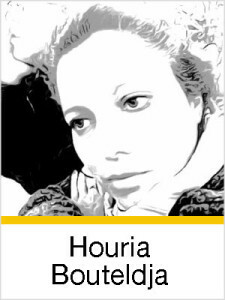 Ce contenu a été publié dans Actualités, Archives, Contributeurs, Houria Bouteldja. Vous pouvez le mettre en favoris avec ce permalien.